Nate Stember's most memorable win of a summer filled with golfing highlights was also the most unexpected. On Aug. 12, the Lincoln High senior and future Oregon Duck came from eight strokes back on the second day to win medalist honors at the prestigious Hogan Cup tournament at Riverside Golf & Country Club. Playing on one of two Oregon teams in the annual junior golf team tournament, Stember was 4-over-par three holes into the 36-hole competition. He recovered to finish the first round at 2-over. But, trailing the leader by eight strokes, he didn't approach the second round expecting to leave with a trophy. "It just shows that you're never out of a tournament no matter how horribly the first couple of holes go," Stember says. Not only was Stember competitive in just about every event he entered this summer, he won four significant Oregon tournaments, reached the round of 32 at the U.S. Junior Amateur Championships (losing to the champion), and finished fourth at the 2018 Junior Americas Cup. Stember's successful run started when he won the Oregon School Activities Association Class 6A tournament. He opened his summer schedule by winning the Centennial, an Oregon Golf Association two-day junior tournament in Medford. He finished 7-under, then won on the first playoff hole by knocking a 60-yard wedge shot into the hole. It was an early indication that this would be a special summer. Next came a one-day qualifying tournament for the U.S. Junior Amateur, an event at The Reserve and Vineyards in Aloha that Stember made a priority. His preparation included two practice rounds and walking the course the night ahead of the tournament. It paid off as he shot 4 under to win and earn his place in the U.S. Junior Amateur. "That was my best round of the summer, not score-wise, but just the way I played," he says. The next two days, he played in the Peter Jacobsen Junior Challenge at Trysting Tree in Corvallis, finishing in a second-place tie — which earned him a spot in the prestigious IMG Academy World Junior Championship. The Bob Norquist Oregon Junior Amateur at Astoria Golf and Country Club started with Stember winning medalist honors for the 18-hole qualifying round. Five match-play victories followed for that title. In the final, Stember birdied the 18th hole for a 1-up win over friend Johnny Ward of Lake Oswego and Jesuit High — the only time Stember led in that match. The following week, at the OGA Golf Course in Woodburn, Stember and Ward battled again. This time, Stember prevailed on the second playoff hole after each birdied the first playoff hole at the Oregon Junior Stroke Play. 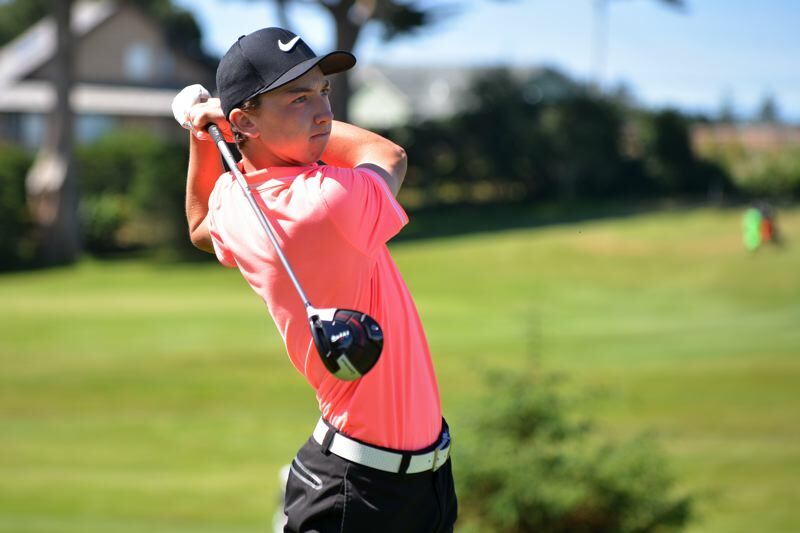 The second week of July was spent at Torrey Pines north of San Diego, where Stember joined more than 100 of the best teen golfers in the world in the IMG Academy Junior World Championships. Stember had played Torrey Pines a couple of times, but never in a tournament. "It was really cool to look at the golf course the way the pros do when they play it," Stember said. "To actually map your way around it and try to go shoot a good score. It was a lot of fun." He hit his first tee shot out of bounds and found himself 7-over only six holes into the tournament. "I'm just completely shocked that was happening," Stember says, recalling his mind-set. "It's kind of a moment where all your golfing ability seems to have left you and you've got to figure out a way to get it back. I knew that's not really who I was as a golfer, so I just had to snap myself out of it. Pretend it didn't happen and play the next 12 holes well." He did that, playing 3-under over the final 12 holes to shoot a 4-over 76. Starting the final day of the four-day tournament seven strokes off the lead, Stember had five birdies over a six-hole stretch to get the 3-under for the tourney with eight holes to play. Suddenly, he was one shot off the lead. "That was kind of, 'Whoa, I might have a chance to win this.' Honestly, it kind of took me out of my game a little bit," Stember says. He bogeyed the next two holes. "I had experience winning and being in contention at OGA events, which are a lot smaller. Maybe it shot me a little bit, but it also motivated me. I didn't play well the last eight holes, but it was a good experience to be in that spot." Not that there is anything wrong with tying for fifth place, four strokes behind the winner of a major international tournament. After an overnight flight, Stember cut short his practice round ahead of the U.S. Junior Amateur at Baltusrol in Springfield, New Jersey, in order to sleep. He says the lost practice might have impacted his qualifying score. He finished tied for 32nd after two rounds of 72. Stember won his first-round match on the 20th hole, then lost to champion Michael Thorbjornsen in the round of 32. He missed a couple of makeable putts that might have made the match more competitive, but noted that Thorbjornsen had birdies on six of the 13 holes played. After a quick stop back in Portland, Stember joined Team Oregon for the Junior America's Cup in Montana. He finished fourth individually as Oregon placed seventh in the 15-team tournament. Stember started the final round seven strokes off the lead, but found himself in a tie for the lead midway through the day. "Just like Worlds, I figured out I'm in a big tournament and I bogeyed three in a row," Stember says. "Just started hitting bad shots. Made some bad mental mistakes and hit some really bad wedge shots." Despite the frustration of those finishes, Stember says "I like knowing where I'm at, for sure. Even if it has hurt me in the past maybe a little bit, if I know where I am it changes your game play a little bit coming down the final stretch. "I think it's just a matter pf learning how to let where you are (in the standings) leave your body when you're in the process of hitting a shot." Knowing where he stands is useful because the approach to each hole is dictated by the need to play conservatively or aggressively. "It's just making sure I'm focused on the shot in front of me and not letting where I am in the tournament affect my process of hitting the shot," he says. Stember describes fading down the stretch at a couple of big tournaments as a good learning experience. Of course, winning a couple of tournaments on playoff holes indicates he can make shots when a title is on the line. An eventful summer behind him, Stember is focusing on enjoying his senior year at Lincoln before he joins the Ducks golf team in 2019-20. And he will focus on fine-tuning his game between now and his final high school golf season next spring. Last winter was spent refining his swing off the tee, work he says was key to his success this summer. This winter, the plan is to focus on "dialing in my distances with my wedges. Half swing, three-quarter swing, from about 50 to 110 yards. Get those dialed in because, really, that's how you make a lot of birdies is to hit your wedges close."